Grand juries and no buildings - State of architectural competitions in India - ArchitectureLive! A news article published recently, reported that the ambitious plan to develop the National War Museum near India Gate in Delhi has been nixed. The fraternity has been keenly watching the project since its announcement as a global design competition held over two stages. A leading design firm from Mumbai emerged as the winner of the competition. 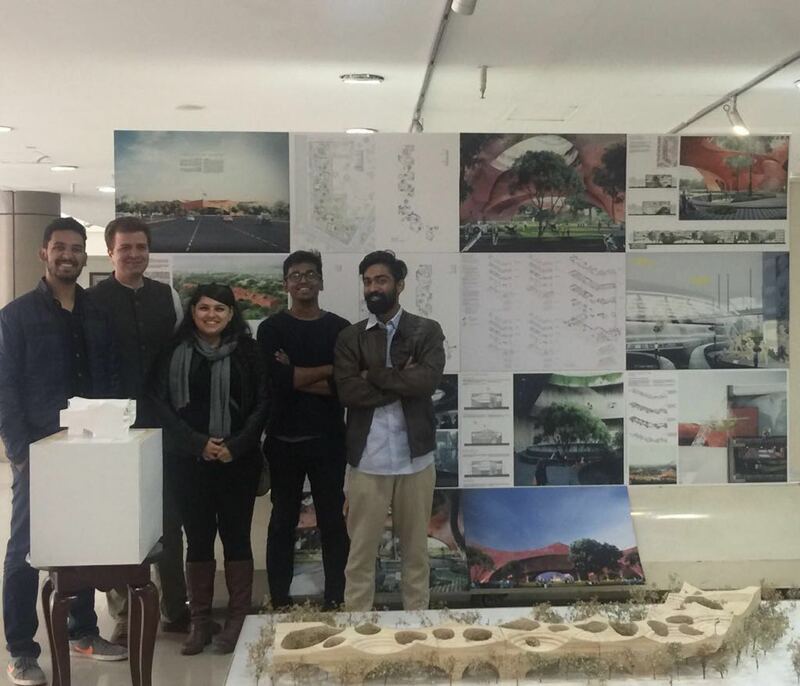 The turn of events has raised concerns about the state of architectural competitions in India. The first few decades of Indian architecture were marked by the construction of national infrastructure such as offices, art centres and institutions of national importance. The architects of the day were burdened with the responsibility of the revival of traditional Indian art and architecture. The idea of Chandigarh, and the foreign education of quite a few Indian architects of the age led the development of a modern Indian architectural movement. Buildings of that period were rooted in the context and yet served as an independent expression of the architects to the modernist design approach. The exposure through the onset of media and internet at the end of the ‘90s opened floodgates for experimentation and the entire canvas of the country has seen bold, vivid and very distinct approaches to design. Indian architecture now echoes global values that many puritans do not approve of. What has remained constant in the journey of Indian architecture over the last 70 years is, the apathy towards competitive spirit. Though this might be symptomatic of our society at large, the fraternity too hasn’t done much for the cause of architectural competitions. While the lack of architectural competitions at the very birth of the republic could be justified to an extent, the lack of it since then has no explanation. This lack of a culture of building competitions to a large extent has harmed the cause of quality public architecture in India. Participatory democracy has been acknowledged as one of the most successful ways of governance around the world and open competitions are a step further in that spirit. Open design competitions foster a culture that not only generates hope, but motivates professionals towards creating better environments. The challenge that the process of public architecture in India faces is twofold. One is the lack of open and fair design competitions and the other is the contractor centric approach to most large scale projects. To elaborate further on the latter, in India many projects such as riverfronts, airports, metro stations are awarded to construction or project management firms who in turn hire the design firms for the project. This not only marginalizes the role of the architect or the designer, but it side lines the importance of design in the project itself. Historically the creation of masterpieces of architecture without competitions in India cannot be denied, but this has been the exception rather than the rule. The process of creating sensitive and inspiring public architecture would benefit greatly from the creation of systematic public design competitions. While quite a few competitions have been held in the public realm over the last decade, the fate that many of them have met is tragic. The Police Memorial by Sidhartha Talwar and Nikhil Dhar, the design of the Amaravati city by Maki Associates, and more recently the supposed fate of the National War Memorial by sP+a are only a few examples. 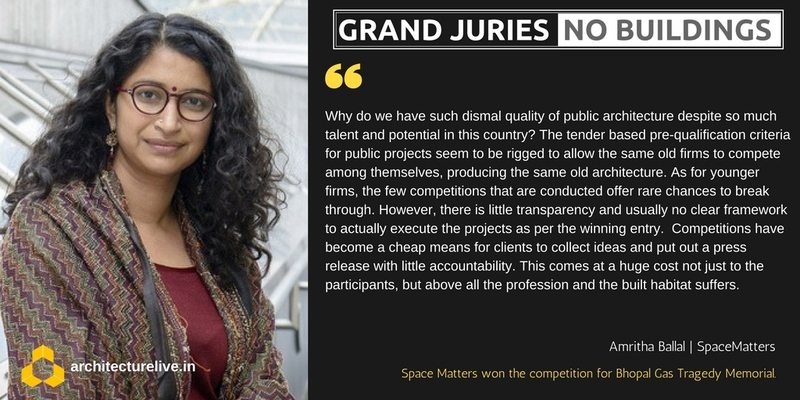 What has been seen in some of these cases is cruel disregard for the procedure, lack of detailed project briefs and requisite approvals as well as sabotaging of competitions by fellow professionals who competed in the same. In the case of the National War Museum, the entire process and the unfolding of events must be seen as a shadow that current events cast on the intent to validate the history of our nation’s heroes and their respective armed forces. To begin with, the formulation of the program isn’t detailed nor is there a content advisor listing nature & details of objects to be presented in the museum itself, surely a battle tank would need a different kind of space from a rifle. Given the stature of the project, comparing the brief with a similar document floated for the design competition of the Guggenheim Museum, Helsinki was only appropriate. What emerged from this comparative analysis is the abject lack of homework and following of the due process on the part of the promoters of the project, in this case the Ministry of Defence. Without bias or prejudice and desisting from comment on any of the designs, at the end of a stated process, one firm was chosen as the winner by the jury members of the two-stage competition with opportunity to evaluate the schemes at least twice over. And from what is known so far, the DUAC rejected the proposal based on the merits of the design itself. It is difficult to decide whether the situation is hilarious or a folly of the highest order. Grapevine also has it that, there has been arm twisting by fellow members of the fraternity who didn’t win the competition. The authenticity of the rumours is yet to be ascertained. The harassment that this sort of handling of the competition causes to the winner is shameful and is an ignominious waste of energy and resources not just the participants, but the public exchequer as well. For a young firm like ours winning this project is both a huge honour and responsibility. 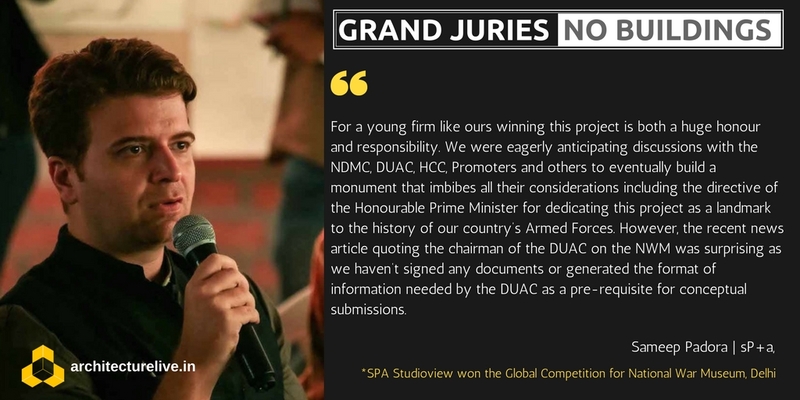 We were eagerly anticipating discussions with the NDMC, DUAC, HCC, Promoters and others to eventually build a monument that imbibes all their considerations including the directive of the Honourable Prime Minister for dedicating this project as a landmark to the history of our country’s Armed Forces. However, the recent news article quoting the chairman of the DUAC on the NWM was surprising as we haven’t signed any documents or generated the format of information needed by the DUAC as a pre-requisite for conceptual submissions. Another competition floated by another ministry of the Government of India met with an unfortunate fate. The National Police Memorial competition was announced in 2010 by the Ministry of Home Affairs. The project brief for this competition was a 4 page document, containing lesser details than the synopsis submitted by students for their thesis projects. The fact that eminent people from the fraternity have been involved in advisory roles for such competitions makes the situation worse. In the year 2011, the design by the team of Sidhartha Talwar and Nikhil Dhar was selected as the winner. The project didn’t see the light of the day because of the Ministry’s unwillingness to pay the professional fee based on the Council of Architecture’s guidelines. “The competition was based on the Council of Architecture’s guidelines, and the professional fee was to follow these guidelines as well. Although, after the results were declared, the Intelligence Bureau (Nodal Agency on behalf of MHA) proposed a fee far below the stipulated guidelines, which the team refused”, said Sidhartha Talwar in a statement. In the case of the Capital Complex for Amaravati city, the services of the winner were terminated to make way for another team of architects. Fumihiko Maki wrote a scathing letter to the council of architecture. In the letter Maki maintains that the grounds on which the services were terminated are demonstrably false. It was rather a wilfully choreographed move to make way for a certain architect in the project. The complete details of the letter can be found HERE. We have been at the receiving end of this apt title- “Grand Juries and No buildings” on not one but two occasions. 2. The international Amravati Capital Complex design in association with Maki and Associates, Tokyo. In the first case, the design was not attacked but the legality of the project on the proposed land was questioned, ironically by the co-owners(the Mumbai Municipal Corporation) who had sanctioned the competition in the first place. In the second case, the winning entry for a state-funded competition (by invitation), judged by an independent jury of experts had its results unilaterally overturned by the Government. The best efforts of the winning firm to meet the Government’s shifting and somewhat arbitrary demands. This was through a set of choreographed events for a favoured Indian architecture firm (Hafeez Contractor) and an international firm (Norman Foster and partners) that had in the first place rejected and declined the invitation from the very same Government. It would be important to discuss the case of the design of the new Academic Hub at the CEPT University. The design has been on the receiving end of criticism from around the globe, including quite a few alumni of the institution itself. While once again referring from opining on the merits of the design, it is disheartening to see that one of the leading institutions of architecture in the country did not lead by example and set a precedent promoting open design competitions. Institutions of higher learnings are temples in their own right and have a great impact on the professionals that they create. It might have been good for the University and for the architect of the current design scheme, had this effort of additions to the campus had been the result of an open competition. Amidst all the action, professional bodies, like the Council of Architecture and Indian Institute of Architects (IIA), who have been entrusted with the responsibility of the welfare of the architectural fraternity have had little or no say at all. Such is the state of these bodies that grieving professionals rarely reach out to them for support or guidance. Time is opportune that these bodies assume a proactive role in fighting for the cause of the profession and the ultimate goal of nation building. While the academic world is abuzz with design competitions, the professional world, in stark contrast, is an absolute void. Young design professionals always look for a fair chance to contribute to society in a meaningful way. 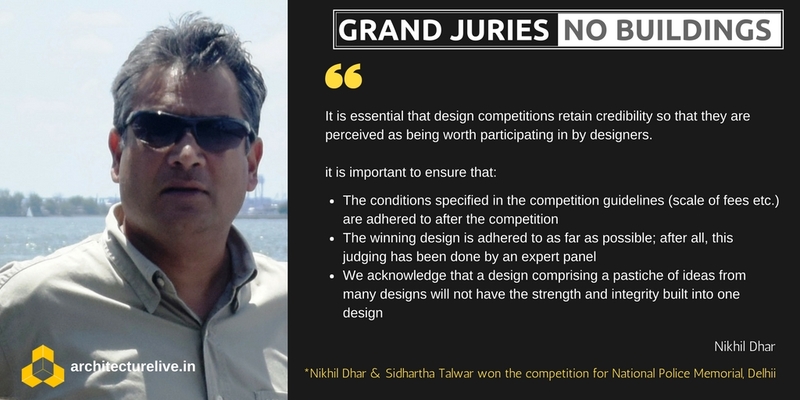 Graceful, well researched, fair and open design competitions should be the norm in the architectural discourse of the country in the coming future. ArchitectureLive has reached out to a few professionals to share their experiences about design competitions, we would request more members of the fraternity to reach out to us by commenting below, and lend us their experiences, views and feedback. The same would be shared in the posts to follow. Excellent findings. It may be a high time to knock the doors of government through COA, COA is established by an act in 1972 and should not only sit on their laurels and become teethless Council. Actually I am glad that you bring this topic of competition design and the result after the submission. As an Architect I had participated quite a number of projects where token money were paid after taking the detail of planning and construction; but the latest Global competition on War Museum is something that kept me thinking whether we strive for modern architecture or remain in age old cocoon of design concept. At least few lines of appreciation for this prestigious project where the Architect visualized something modern to show the military in it’s strength and valor by using STEEL Structure; I will be highly pleased if you let me show you the concept that I gave and appreciated by TATA Steel.